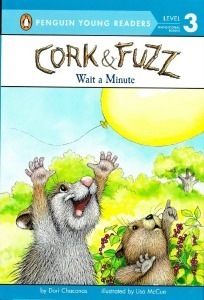 CORK AND FUZZ ARE NOW ON FACEBOOK! Cork was a short muskrat. Spring cleaning made him very, very happy. Fuzz was a tall possum. He did not like to clean. Spring cleaning made him very, very tired. Two best friends. One always ready to work hard. The other one hardly ever ready to work. Cork was a short muskrat. He knew how to wait. If Fuzz slept late, Cork said, "Oh well, I will wait for him to wake up. Fuzz was a tall possum. If Cork slept late, Fuzz said, "Cork, wake up! Wake up right now!" Two best friends. One knew how to wait. The other one just knew how to be Fuzz. Cork was a short muskrat. He liked adventures. He liked small adventures. Most of his adventures were safe. Fuzz was a tall possum. He liked adventures. He liked big adventures. Most of his adventures got him into trouble. Two best friends. One thought about being careful. The other one did not think at all. Cork was a short muskrat. His house was in the middle of a pond. He made it with sticks and reeds and mud. 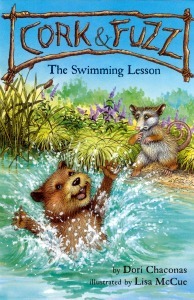 It was a muskrat kind of thing. Fuzz was a tall possum. He house was a hole in a tree. He stuffed it with leaves and grass. 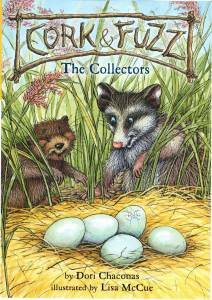 It was a possum kind of thing. One wet muskrat and one dry possum. They were different, but they played together every day. It was a fun kind of thing. "Where did you find the pokie-pie?" Fuzz said. "I did not find him," Cork said. "His mother gave him to me." "Not to keep," Cork said. "I am helping. I am babysitting." Fuzz looked at the porcupine. 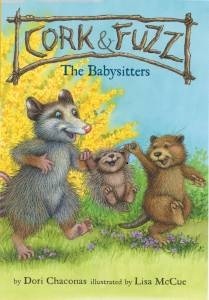 "I would not want to babysit on him," Fuzz said. "I would get poked with a pokie." "Erk!" said the baby porcupine. "I found a baby something," Fuzz said. "It is not a baby," Cork said. "It is a chip-mouse." "He is cute and bouncy," Fuzz said. "I think I will keep him." "You cannot keep a chip-mouse," Cork said. "I found him," Fuzz said. "I can keep him for a pet. Finders keepers!" The ducklings popped out of their shells. "They see your feather," Cork said. "They think you are their mother." "Really?" Fuzz said. "I will collect these baby buzzard bees!" "You collect too many things," Cork said. "I want to play stick ball," Cork said. "I do not know how to play stick ball," Fuzz said. "I will show you," Cork said. He found a big, round pinecone. "This pinecone will be the ball, right?" "Right," said Fuzz. "And that stick will be the stick, right?" "I am learning fast," Fuzz said. "Something is not right," Cork said. "I am older than you, but you are taller than me." "Does it matter that I am taller than you?" Fuzz asked. "I am older," Cork said. "I need to be taller. It is a rule. Do you think you can be shorter?" 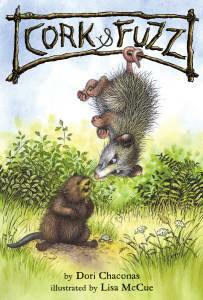 "My name is name is Fuzz," the possum said. 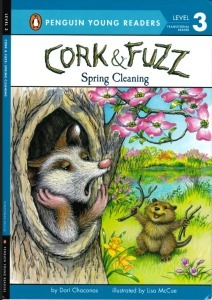 "My name is Cork," said the muskrat. "Are you a duck?" Fuzz asked. "Ducks go cork! cork!" "Duck do not go cork! cork!" Cork said. "Ducks go quack! quack! I am a muskrat. I float like a cork." "I float like a rock," Fuzz said. 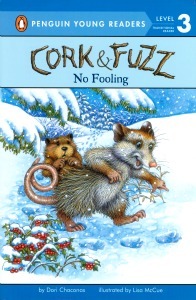 READ MORE ABOUT CORK AND FUZZ ON FACEBOOK!